On the recommendation of the Earl of Eglinton and Winton, Lord Lieutenant of Ayrshire, the following gentleman has been added to the Commission of Peace for the county – Robert Shields (shown below around 1902), Harbour Master, Ardrossan. 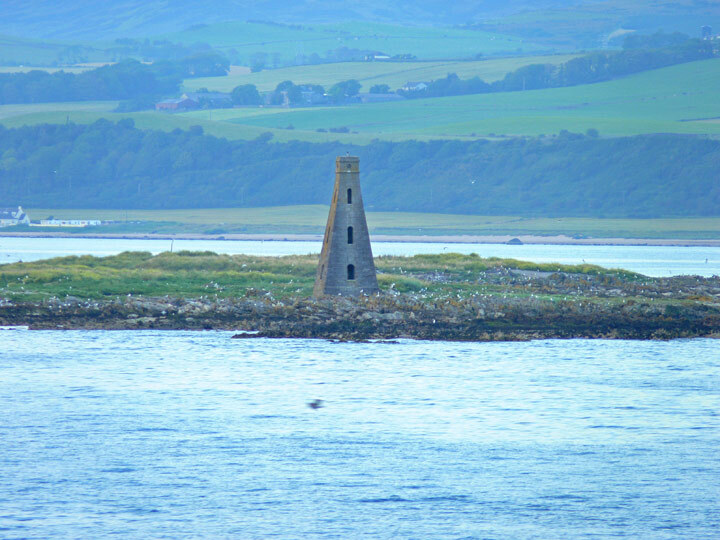 A distressing accident occurred at Ardrossan yesterday, whereby two young men were drowned. Three young men, named respectively Muir, Gillies, and Stewart, went out in a rowing boat to lift lobster creels at the Horse Island (shown below in 2011). About 150 yards from the island the boat foundered in a heavy sea. Muir, an excellent swimmer, pluckily took hold of Stewart and managed to take him to the rocks at the south end of the island. Afterwards he returned in search of Gillies, whom he was unable to find. To his horror he discovered on swimming back to the island that Stewart had been washed away. Muir then endeavoured to attract the attention of the people on the mainland by waving his clothes, and was at length perceived by some seamen at the harbour. The pilot boat and tug were at once despatched, and Muir was taken off in a state of complete state of exhaustion. No trace was got of the others. The Ardrossan Company of the Ayr and Galloway Field Artillery is not growing so rapidly as was expected at first. The enlistments to date only number thirty-five. During the week-end nearly 10000 Scottish holiday-makers arrived at Douglas, Isle of Man. Several steam packet companies made special arrangements to provide fast means of transport for visitors from Glasgow. The new turbine Ben-My-Chree landed 2500 passengers in Douglas. The vessel accomplished the journey from Ardrossan in the teeth of a strong breeze, almost approaching a gale. She ran the 100 knots between the two ports in five hours. In Kilmarnock Sheriff Court yesterday, before Sheriff Mackenzie, parties' agents were heard in an action at the instance of the Parish Council of Ardrossan against Captain Charles Torrance to interdict the defender from acting as a delegate to the board of management of the Cunninghame Combination Poorhouse. Mr James Patrick, Writer, Dalry, for the pursuers, explained that on 11 December 1907, Captain Torrance was appointed as a delegate by the Parish Council and that at that time he received specific instructions as to how he was to act, more particularly in the matter then in dispute, namely the appointment of a medical governor and Captain Torrance accepted office on the conditions attached to it but at a later stage he voted in a way which was opposite to his instructions with the result that on 19 June last the Parish Council recalled the appointment of Captain Torrance and appointed Mr A Crawford in his place. Captain Torrance nevertheless proposed to continue to act as a delegate and on that ground the Parish Council had raised this action of interdict. Mr Neil D McMichael of Messrs J and J Sturrock and Company, Kilmarnock, appearing for the defender, argued that the Parish Council had no power to recall the appointment, which had been made for one year, in the same way as Parish Council representatives were appointed to the County Council. He objected also to the interdict being granted on the ground that there would be no meeting of the board of management until October next and that the interdict would not prevent Captain Torrance from doing anything till within a very short time of the expiry of his term of office. He further pointed out that Captain Torrance was only one man amongst thirty-five and that his vote would not make very difference. The Sheriff deferred his decision. Yesterday the Coatbridge police received notice from Ardrossan to make enquiries as to the whereabouts of a young man who was due to be married at Ardrossan on Saturday (19 December 1908) but failed to put in an appearance. The young man wanted was employed at Calder Ironworks and was lodging in Coatbridge. It is stated that he left his lodgings early on Saturday morning to get a new suit and had arranged to travel to Ardrossan per the 3.20pm train from Calder. The landlady and another lady turned up at that hour to accompany the young man to Ardrossan, but he failed to put in an appearance. The missing bridegroom is said to be a native of Ardrossan.